If you do not like spiders, do not continue reading this post. You really, really, REALLY will not care for this one. Also be warned that at the end of this post are a couple of gross photos of my foot. If my feet and spiders bother you, do not continue. If you have a fetish for large spiders and nasty looking feet, you're gonna have such a good time I'm thinking of charging a fee. Periodically, I hear people say that "butterflies are the new birds" meaning people are starting to list butterflies and not just birds. 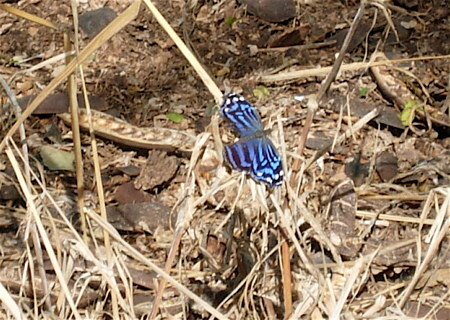 Now, if it's a charismatic species like the above--a Mexican Blue Wing, I can kind of get on board with that. We don't have a big variety of butterflies in Minnesota, but visiting south Texas I can see where people get the spark. When I went to see the northern jacana in Weslaco, it was chock full o butterflies. I would pass a flowering bush and a virtual swarm would fill the air. There is a butterfly festival that happens in Texa and even optics companies are responding by making optics that have close focusing abilities to 3 and 4 feet. I'm marginally interested. I love the Rio Grande Valley Bird Fest--it's my number one favorite in the country, but if I could change anything about it, that would be that there should be separate field trips for the butterflies and dragonflies. I'm not saying that I don't want them pointed out here and there, but one of the trips I took we had a guide who was REALLY gung ho for dragonfies and we kept stopping for them constantly. It really irritated me because didn't pay money for an insect trip, I paid for birds. The trip really seemed to drag for me as we stopped for them, it didn't help that it was chigger and mosquito city where we were birding and a good portion of the trip was out in the direct sun. It was one of the reasons why I decided to ditch the Brownsville trip the next day and go out on my own. I could take control of destiny and not have to stop for bugs I had no interest in. 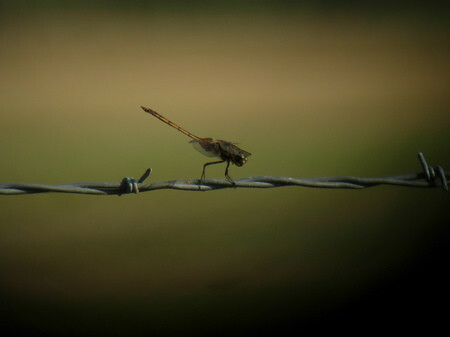 We looked at the above which is a dragonfly not typically found in the United States called a Tawny Pennant. I don't know, I can understand getting excited about black dragonflies with red wings or the all purple dragonfly but really, it should be separate trip for people who really want to watch that sort of thing. Can you see the spider in this photo? There it is, lurking in the grass behind some unsuspecting birders. This guy was GIGANTIC. 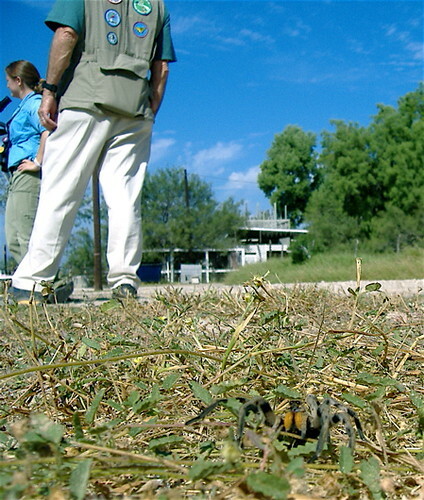 It was so big, someone thought it was a tarantula. Here it is next to my Handheld Guide to Birds. That's a pretty big spider. Think that it is a wolf spider, but I have never seen one that big in Minnesota. 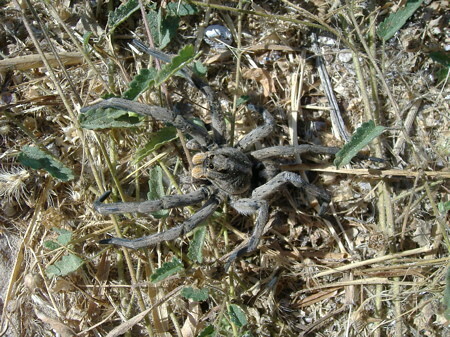 If this is not a wolf spider, feel free to correct me in the comments section. I'm not the arachnid chick. Eh, look at those fuzzy appendages at the mouth. 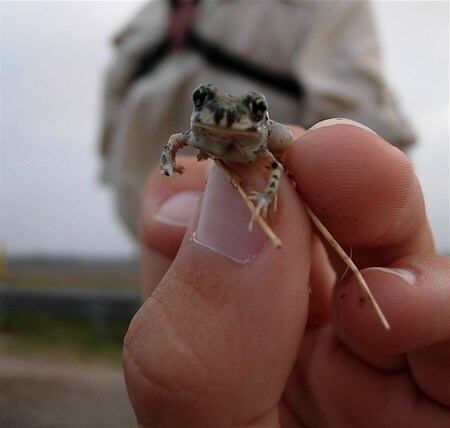 The spider was twice the size of this tiny frog. Any guesses on this species? 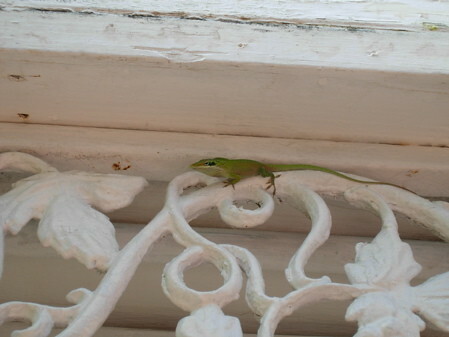 Here was cute little anole looking for tasty bugs on a patio--these cute little guys were all over the place. Oh, now this was interesting. 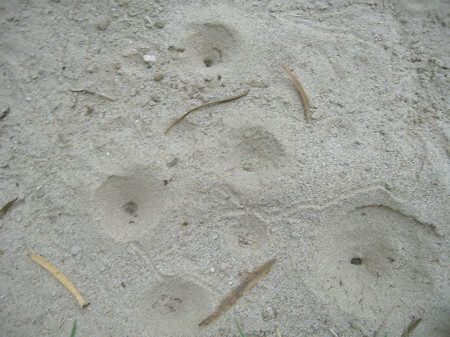 These were little pits made by antlions. These are basically little Sarlacc pits targeted towards ants. These little larvae make pits to trap ants and eat them. 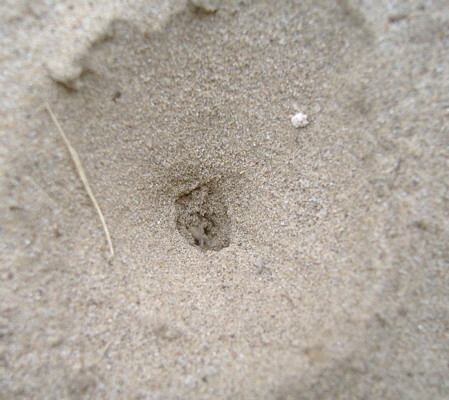 A small ant (above) falls into the pit and as it tries to work its way out, that triggers the antlion to grab the ant and then feed on it. 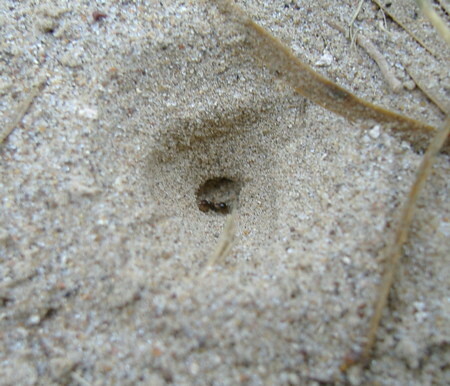 If you look closely in this pit, you can see the front mandibles of the antlion. As I watched these little pits, I noticed that a species of ant that was red with very long legs could easily crawl out of the pits without triggering the predator below. Small ants did not stand a chance. 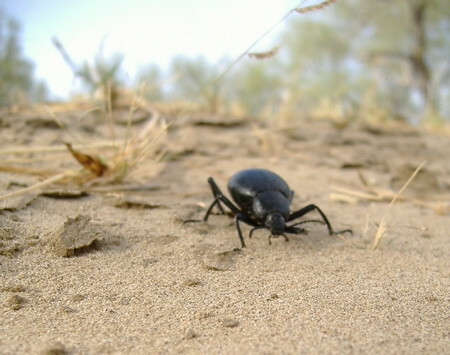 Here we have dung beetle in search of ...dung. Now, in Minnesota we try to protect ourselves from mosquitoes and ticks. In Texas we watch for fire ants and chiggers. 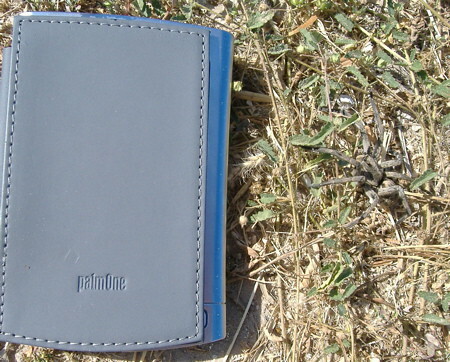 On one of the field trips we were going to walk through some grass to look for Sprague's pipits--guaranteed chigger bites. We were warned to be very liberal with the insect repellant--which I was. The mistake I made was spraying my feet with my Keens on. I should have taken the whole sandal off and sprayed, covering the entire foot. If you look at the pattern of the swollen chigger bites on my foot, they follow the straps on my Keens. This looks a lot worse than it really feels. It's an odd little souvenir, I'll be scratching these bites for the next few weeks and thinking, "Ah, Texas." Amy recommended I try something called Chigger X to soothe the itch and it works well. I'm still not really clear on what it going on with chiggers, I've heard so many different things. Hillary the Zeiss rep told me to put nail polish on all the bites because the chigger is still inside my skin and that the nail polish would suffocate and kill them, relieving the itch. I only had black or pink sparkley nail polish with me and went with the sparkley. They stilled itched. Hillary said I should have used clear, but really the bites looked so bad that I don't thing clear would have made that much of a difference. Someone else later told me that the chiggers are no longer inside me and that whatever they used as an anti coagulant to get blood is still in there causing the itch. I have no idea what' going on. Whatever it is, I'm glad sandal weather is finished in Minnesota and I can keep my feet hidden. Ah, what I go through for a good bird! Anyone else have any insight for the chiggeriness that has taken over my feet?